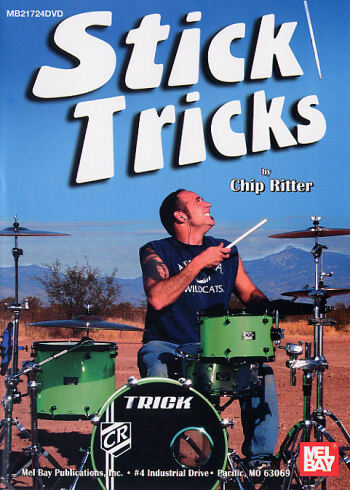 Tiger Bill Reviews Stick Tricks DVD by Chip Ritter from Mel Bay Publications, Inc.
Chip Ritter, author of Stick Tricks, is one of those pros who has been working for many years at the trade he truly loves. In the drum book written by Chip and first published in 2002 called the Ritter Method, he described himself as "a full time professional drummer who is not famous and not rich but who plays drums because he loves music." And although that may have been the case back then, Chip has steadily been making a name for himself and he is now beginning to get the recognition he deserves. The release of this DVD by Mel Bay Publications, Inc. is proof and I predict that it will only be the beginning for this truly talented, dedicated musician. Chip Ritter is one of the most exciting and entertaining drummers that I have ever seen behind a drum kit, which is why I invited him to perform at my DrumBeat Festival in 2007 where he was an instant hit with the audience. Chip not only plays great and puts on a great show but he knows how to teach, which is a rare combination. If you've ever watched and envied "showboat" style drummers who twirl and spin their sticks without ever losing a beat, you're in for a real treat. On Stick Tricks, Chip not only entertains us with his cool spins, throws, flips, and juggling - all while keeping a perfect groove, he also teaches us step-by-step how we can accomplished the same thing. Stick Tricks in 13 Easy Lessons! Chip, evidently not superstitious, breaks his DVD down into 13 separate chapters with each lesson building on the one before it. There are also three main solo chapters that show Chip demonstrating his amazing Stick Tricks in live performances. Trick #1: Raise Your Hand on the "AND." This one prepares us to perform Stick Tricks by explaining where and how to raise our hand for the trick without conflicting with the groove. Trick #2: The Fake Spin. Many drummers refer to this as the fake rock twirl because many rock drummers use it to add showmanship to their performance. Trick #3: The Finger Flip. Another cool trick. Solo #1: Shows Chip in live performance employing the the techniques we've just learned. Trick #4: The Garden Weasel. This is a combination of the previously learned Finger Flip and Fake Spin. Trick #5: The Hit, Throw, Catch SINGLE. Chip uses tennis balls to help us build the proper technique. Trick #6: The Hit, Throw, Catch DOUBLE. A variation on the previous trick, only more difficult! Solo #2: Another compilation of solos featuring Chip performing Stick Tricks we've learned up to this point. Trick #7: The Back Flip. Now things are getting really interesting and very tricky! Trick #8: The Double Back Flip. Things are now getting down right difficult! Trick #9: The Back Flip Crossover. It looks so cool but you want me to do what? Solo #3: Oh! That's what you want me to do? This solo outing has Chip demonstrating the Back Flip Crossover in performance. And he makes it look so easy! Trick #10: Basic Juggle 101. Chip again recommends the use of tennis balls in place of drumsticks for easier and safer practice! Trick #11: Two Hands, Hit Throw Juggle. Now we're learning to play the drums in between the cool Stick Tricks! Trick #12: Juggle Multiple Hits. Like the chapter title says, now we're playing a complete groove along with our Stick Tricks! Trick #13: Juggle 3 Sticks, "Rockin' Beats." We're now juggling three sticks while maintaining a cookin' groove. Yes. This is just about as difficult as it sounds. But it's much easier when you learn the right way to develop it, step by step, via the Chip Ritter Method! In addition to the above listed contents, Chip includes a ton of exciting live performance footage throughout nearly every chapter. And here's a tip: Don't bypass the Credits at the end of the DVD or you'll miss same real cool bonus footage! Not only is Chip an extremely original and interesting performer, he is an experienced and amusing teacher who keeps the learning fun all the way through. Although it has taken Chip many years to develop his Stick Tricks to such a high degree, he has managed to compress much of it in this step-by-step method that takes a total of about 45 minutes to complete. The bottom line is that once you've seen Chip Ritter perform his Stick Tricks, you'll be hooked and you'll want to add some of this cool visual eye candy to your own bag of tricks. Chip's Stick Tricks DVD represents the best of the best and I highly recommend it to every drummer regardless of age, experience level, or musical style,. And at a retail price of $24.95, Stick Tricks it's a bargain. Click Here for Video Clip samples from Stick Tricks by Chip Ritter from Mel Bay Publications, Inc. Then pick up a copy today and start having fun!